As teased last week, my current obsession is applying what I’ve learned about Lego architecture to landmarks that I know well. 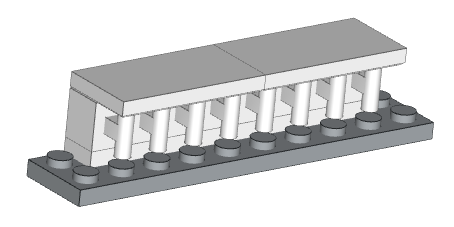 Without giving away the whole game, let’s say that an important part of the project is building convincing columns in Lego. There are several good how-to resources available for building medium scale columns (a Flickr pool, a couple of YouTube videos, some more elaborate and authentic tutorials focused on Greek and Roman styles, some really elaborate stuff on the Corinthian order specifically), but not a whole lot summarizing the options for building Architecture-scale columns. By Architecture-scale I mean miniature models such that the scale might be 1 brick height = 5, 10, or even 20 feet, as is the case with some of the moderate size models in the line. Fortunately the Architecture line itself provides a pretty good set of options, and there are a few others that might be worth your consideration. Let’s explore! Note: There’s a whole ‘nother topic on capitals. We’ll come back to that another time. The humble cylinder brick (aka Brick 1 x 1 Round, #3062a or #3062b), which I first encountered in trans yellow and green in the classic Space days, has both advantages and disadvantages for building columns. Pro: you can stack it to create whatever height you like. Cons: if all you have is the common grooved model (as opposed to the older variant with no bottom lip), the groove can be distracting. This approach combines the Bar 3L (#87994, also available in 4L version) with the Plate 1×1 Round with Open Stud (#85861). You simply push the bar down into the open stud and off you go. Bars are versatile for columns, as you can also use them with clips (e.g. #4085) to hold them to a façade. I’ve topped the columns with simple round 1×1 plates (e.g. #4073), but see my note about capitals above. 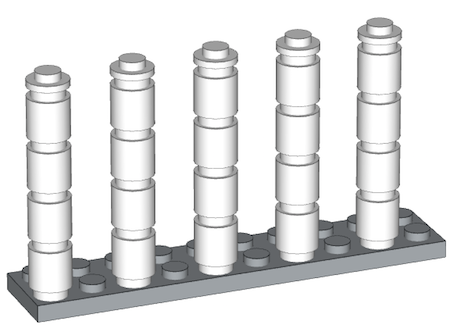 The minifig telescope (#64644) provides surprisingly ornate, if small, columns, as seen on the Lego Architecture Louvre set. Here I’ve paired them with #4073 again. 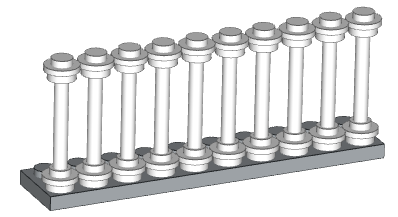 There are a couple of fence-type items that make good, if plain, columns. The spindled fence (#30055) is probably the most straightforward. For cases where columns combine with arches, using an arch part (like this Arch Panel, #90195, also known as a “castle window”) can work just fine. If you’re building in a really small scale, the Brick with Handle (#2921) can do the trick. The disadvantage is that you have to raise the brick, since the handle extends the full height. There are probably more options, and I’ll probably figure out a few more as I build, but I thought I’d start this list and see if anyone else has additional ideas.